I agree to these policy terms. Due to the limited seating on our trips and/or classes a 7 day notice required for cancellation prior to your trip and/or classes date. Upon your reservation we are saving a seat or seats for your experience where others may have to be turned away due to limited seating availability. A $20 twenty dollar seat charge would be charged to the reserving credit card for any and all seats reserved but not used. If you book within seven days from your trip date the twenty dollar seat charge still applies. If you have purchased a seat and/or seats or been gifted a seat No Refunds. The twenty dollar cancellation charge still applies in the seven day cancellation window and you may book another trip date with the purchased or gifted seat/s as long as with in expiration date. Groups paying a discounted rate for the seat and/or seats have a 14 day notice required for cancellation prior to your trip and/or classes date. Any and all seats reserved but not used would pay the full discounted rate given for the group. We understand at some point, everyone has had to make a change to a reservation or request a cancellation for an event they’ve committed to attending. There are endless reasons for change requests, ranging from conflicting schedules to the changing of one’s mind. Our policy is firm and fare in the fact that we charge only a cancellation charge per seat and not the full swim rate. Any and all purchases for trips and /or classes are final -No Refunds. Education materials will not be exchanged, no in store credit and No Refunds. The balance of the class monies if any, may transfer to another class only. Purchased Merchandise maybe size exchanged only and must be in original packaging, have receipt of purchase and must have been purchased with in the last seven days. If item was not packaged like wetsuits No Refunds, no exchange, see staff. Rental equipment is by the day and just like a movie rental if you did not use there are No Refunds. Air fills/tank/regulator work, diver must show scuba certification at time of work request. The private marina in Crystal River where the boat is launched for trips/class charges $5 per vehicle. 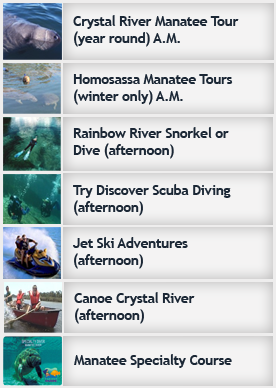 Rainbow River is a County Park and they too charge $5 fee per person for parking and use of their nice facilities. We reserve the right to cancel a sale or change terms of our agreement.